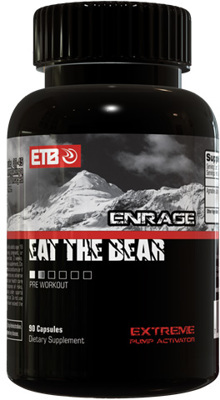 ETB brings you Enrage, a pure agmatine sulfate pump pill. NO caffeine, NO jitters, just pure pump. Enrage is designed to be taken with a pre-workout or by itself to amplify the pump effect and give you more endurance and power through increased blood flow to the muscle. TO MAXIMIZE YOUR RESULTS, consider supplementing this product with ETB Pure Isolate Whey Protein line, UnCaged 2.0 and ETB Bear Essentials Multivitamins.